Events To Watch This Weekend At The Champion Fast Track Invitational! Alysia Johnson will look to show off her range dipping down to the 55m dash this weekend. She is one of the states best in both the 300 and 500, but is certainly no slouch in the 55 with a PR of 7.16. She'll battle with Zariyah Black, Olivia Hee, Ty-Lisha Kimble and Zariere Dumas (SC). This is a deep field, but no one has been able to come close to RJ Terry's NC#1 of 6.41 so far this indoor season. James Maye holds a PR of 6.49. There are plenty of stars in this field that will push Terry to his limits, but I know he has his eyes set on a much faster time than 6.41. Patterson holds outdoor PRs of 21.07 and 46.98 and will look to run a fast time in his first ever indoor 300. He'll have some stiff competition in 6.41 55m runner RJ Terry, Eddy Sherman and future star Romell McRae. I'm expecting a breakthrough performance from some of NCs best trying to take down Patterson. We could see a state record go down here. Maya Singletary sits at US#2 with a PR of 1:14.47 from her indoor opener in December. She's currently NC#2 All-Time from her NCHSAA 4A State Championship last winter. 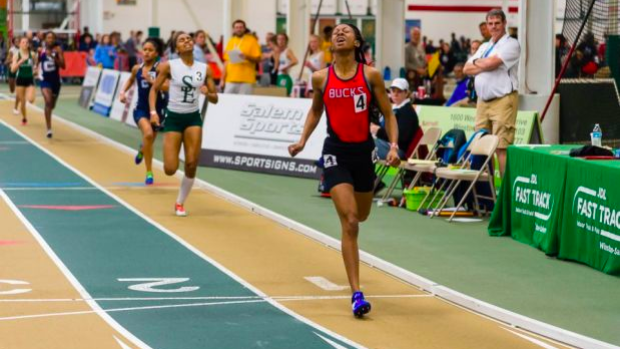 The UNCC commit will need to run faster than 1:13.02 to break McKinley McNeill's State Record, which I'm expecting her to do as some point this indoor season. Four boys in the fast heat have run under 1:07 this year with McRae and Morgan sitting currently at US#4 and US#9 in the event so far this year. Liam Anderson and Edwin Anderson have run low 1:06s on an outdoor track as they look to battle with the nations best and emerge as stars in the event. Sophomore Adam Habas (NCISAA 3A 800m State Champ) and Senior Ricky Kidwell (NCHSAA 3A 800m State Champ) have proven themselves in the outdoor 800. They're up for a big test in the 1000 this weekend where Michael Moerk comes in with a PR of 2:35 from last season. NCISAA 3A rivals Coleman Mitchell and Ben Mitchell will dip down in their preferred distance and test their wheels early on in the 2018 track season. A lot of these girls, Dokholyan, LaTour and Wright, will be battling for the 3A 1600m crown next month and all were in contention for the 3A XC title in November as well as Hill and Whitworth. Dokholyan and LaTour hold sub 5 1600 PRs. Bissinger and Petit will also come into the meet with PRs under 5:15 in what should be the fastest 1600 in the state so far this winter. This is going to be an epic final. Rhodes, a 100m Hurdle All-American, and Patterson, a 400m Hurdle All-American out of South Carolina headline a field that could see a lot of girls under 8.20. Rhodes and Barnes have run 8.13 and 8.18 respectively this season, currently US#7 and US#9. With Hillside moving down to 3A with the NCHSAA realignment, we won't get to see some epic state meet battles between these two powerhouses. Luckily we'll get to see them tomorrow. These are two of the best 4x200 teams in the country, I'd expect a new NC#1 and US top 10 time tomorrow if these teams are running their A Teams. They'll also square off in the 4x400 later in the day with both teams likely being well under 4 minutes. I expect these three schools to be battling to the line at the NCHSAA 4A State Championship for the 4x200 title next month. Southeast has ran 1:30.18 at Liberty earlier this year on an indoor track, while Reagan ran 1:30.58 on outdoors in November. Garner has a ton of sprint stars as well and have run 1:31.90. We'll see if anyone can hang with these stud teams. This is going to be a fun event to kick off what should be a great meet. Though we don't know who is running what legs, it's a safe bet that Green Hope and Mount Tabor are running their A squads due to their seed times at 8:03 and 8:06. The 4A XC State Champions versus the 3A XC State Champions. NCISAA 3A State Champions Providence Day also look like they'll be running their studs. We could see a sub 8 performance if the race goes out well. Lindsay Absher (West Forsyth) is going after the state recrod of 13-0.75 after jumping NC#2 All-Time 13-0 last weekend. (Read Story Here). McKenna Brunick (Leesville) has jumped 12-0 and Maura Lane (Panther Creek) 11-7 this season. Aside from Absher's state record and JDL Facility record attempt, we could see two other girls crack the top 10 all-time list. Spencer Evans (Lake Norman) and Ben Finger (North Gaston) have vaulted 15-7 and 15-2 respectively this indoor season. Rabinowitz was the 4A State Champ last year with a PR of 15-1 as well. The field also has plenty of 14 foot+ vaulters in it as well in what should be a fun event to watch. A battle that will never get old between Veronica Fraley and Kayla Beasley will take place once again this weekend. They hold indoor PRs of 46-3 and 43-0.75 respectively. Naadiya Faison and Kaitlin McGoogan also show potential to throw over 40 feet this weekend.